Dental Emergencies happen. Whether biting into that hard food, or goofing around outside, a dental emergency can put a sudden painful halt to your day or night. Most dental offices have a plan in motion should this happen to you. Your dentist does not want to leave you in pain, they will act as quickly as possible to help. Is your emergency late at night or on a weekend? We have made arrangements with colleagues and an emergency referral service if your primary dentist is unable to tend to your emergency. 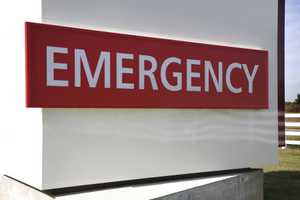 We see a dental emergency as anything that is causing you pain or discomfort. Most commonly, injuries to your mouth includes teeth that are avulsed or knocked out, teeth that have been extruded or loosened, or are broken or fractured. Additionally, we want to see patients who have had cuts to their soft tissues including lips, gums or cheeks. We recommend taking the following steps while waiting to see a dentist in a dental emergency. • Fractured or Broken Teeth - If a tooth is fractured or broken, begin with rinsing your mouth with warm water. Then place an ice pack on your face to reduce swelling. If you have the broken piece of tooth, take it with you to the dentist office, wrapped in a wet paper towel. • Avulsed - If a permanent tooth has become knocked out of it's socket, first place the tooth into a cup of milk. If no milk is immediately available, and choking is not a concern, keep the tooth in your mouth. It is ok to rinse the tooth, but DO NOT scrub the tooth, we want to preserve the tissue that may be on it. Contact our office immediately. • Toothache - Toothaches can be painful and upsetting. We first ask that the patient attempt brushing, flossing and rinsing to remove any debris in the event of a toothache. Take an over the counter pain relief medication to relieve the pain. If you have suffered a dental emergency please please contact our office.